This month, we’re making Bonnie Hunter’s 12 inch block, Scrappy Trips Around the World–follow the link for Bonnie’s directions. This is Jo’s block. This month’s block is completely scrappy with only one rule. The fabric that forms the corner-to-corner diagonal must be black or another very dark color. Other than that, fabric-wise, anything goes, but remember, as always, the golden rule applies–please make blocks that you would be happy to receive. Because these are larger blocks, the target set size for winners will be 35 blocks. You may make a MAXIMUM of NINE blocks for chances in the drawing. If you make multiple blocks, you may use the same black/very dark fabric in all your blocks. You may repeat the other fabrics, too, but avoid using identical fabric combinations. The reason I ask everyone to use these labels so we are all using the SAME labels. It makes it easy to find your posts, to make sure your blocks are counted, to help the winners figure out which blocks are “in the mail.” These 4 labels will be added to the “Useful Labels” in the right sidebar, to make it easy to find them (and easy to find all the posts that are correctly labeled). These (completely randomly arranged) virtual blocks were made by sneak peekers, Cathy C, Cathy S, Cyndi, Ginny, Gwen, Jo, Krista, Kristin, Laura E, Maree, Michelle, Pat H, Sue and Wendy F.
Of course, much more regular/traditional arrangements are possible. How will you arrange yours? The virtual quilt is great since it lets us see how the combinations of colors might look in a finished quilt. The very brights are fine in an overall design, while mine (thought they were bright) look fairly muted. Gives me ideas for the rest of the blocks to come. oooh i LOVE it! newbie question 🙂 Are we squaring to 12" or 12.5"? This still confuses me unless specifically said. Thanks! Laura, you will square your blocks to 12.5 inches. 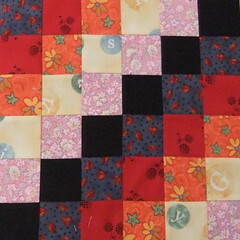 It's called a 12 block, because after the blocks are sewn into a quilt, they will "finish" at 12 inches. The extra 1/2 inch is the seam allowance (1/4 inch around the block). that's what i thought thanks! Wow these blocks are FAB! I have been away for a long while (stopped sewing) but these are going to bring me back to sanity.